Begun, The Digital Age of Comics Has The digital age of comics has arrived, and with it, bad news for retailers and collectors -- but good news if you don't like going outside in the heat. ... And the previous age of comics, whatever it was called (the Modern Age? The Bronze Age? Copper? Iron? Molybdenum?) ended with neither a bang nor a whimper, but with publishers, creators, retailers and fans exchanging lots of puzzled expressions and a collective shrug. Everyone seems to agree that the proverbial game has changed, that some funnybook Rubicon has just been well and truly crossed, but beyond that, O magic 8-ball? For months, it's been possible to legally download comics from various publishers. (Illegally, of course, it's been possible for years.) But on Wednesday of last week, for the first time, a major comics publisher made a new comic available for purchase online on the same day it went on sale in comic shops. 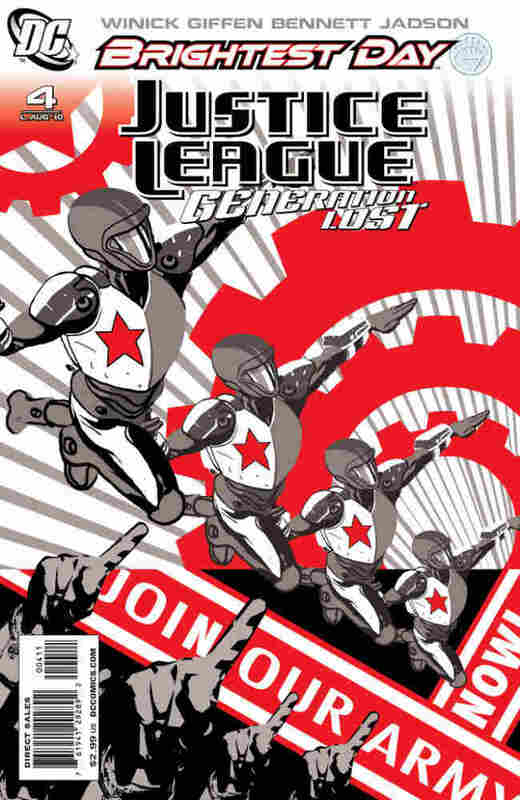 "What was DC Comics' Justice League: Generation Lost #4, Alex-bot?" Marvel has gone out of its way to assure parsimonious fans (and nervous retailers) that today's experiment is just that, and that they're still figuring things out, particularly when it comes to pricing. DC, on the other hand, has signaled that they're prepared to barrel ahead, even hinting that several series will be going the same-day-download route soon. The Marvel app debuted with the iPad's launch. Indie publisher BOOM! Studios (publishers of Monkey See favorite Mr. Stuffins among others) launched its own iPad app in mid-June, which was followed closely by the announcement that the publisher's entire back catalog would soon be available. DC's Ipad/Ipod app appeared only last week, using the same Comixology technology used by Marvel and BOOM! That technology ensures that the comics look great -- crisp, colorful -- on the iPad's big screen, and the page-by-page navigation is smooth. You can choose to zoom in to a single panel (losing a bit of the crispness in the process, though) and allow the story to advance one image at a time. Move rapidly through these panel-to-panel transitions, however, and things can get a bit queasifying. But it's the best way to see how much forethought has gone into the Comixology software: The "Guided-View" tech easily navigates contemporary page layouts, which rarely if ever feature the simple nine-panel grid of old. The perspective automatically zooms out to show you a splash page or a double-page spread in all its glory, and zooms in again to guide your eye through the action in a way that certainly feels intuitive. Comixology offers its own app, through which comics from indie publishers like Image, Dark Horse and Top Cow can be purchased alongside Marvel, DC and BOOM! titles. There's also a web viewer, for those who don't own any of the compatible mobile devices. And those who just hate Apple. Another platform for downloading and reading digital comics, Graphic.ly, features fewer titles, but unlike Comixology allows readers to download them onto their desktop computer (a web viewer is still in the works). Navigation is easy, the colors are crisp, but what the Graphic.ly folks are really playing up is their social networking/community building elements -- friend requests, and what have you. •And Comics Alliance brings the contextual analysis. Here, then, is what I take home from all this. Theoretically, at least, a larger audience. Every single non-comics-reader to whom I've shown the various comics apps has murmured appreciatively. "I think I'd start reading comics!" they say, perhaps out of sincerity, perhaps just to shut me up about how cool John Romita Jr.'s Eternals look. This certainly supports what digital comic advocates like Chicago Sun-Times tech reporter Andy Ihnatko have been prophesying, to anyone who'll listen but especially to comics fans, for a while now. I was skeptical whenever I'd hear Ihnatko avow that digital distribution will "make the market for comic books that much broader and that much more relevant." And I'm not prepared to accept that droves of non-comics fans will suddenly manifest an interest in the Byzantine backstories of, say, the Secret Avengers. But the access is there, and the price point is (relatively) low; I suspect that once "lit-comics" publishers like Fantagraphics, Drawn and Quarterly, Top Shelf and Abrams start turning up in the digital marketplace, comic's barrier-to-entry may just vanish, unceremoniously, in a puff of pixels. That same (potentially) larger audience, and a new revenue stream. When DC launched its digital distribution channel last week, they made a point of the fact that creators would earn royalties on digital "reprints". As Marvel had not up to that time made a similar announcement, and because Marvel is infamously hard-nosed on the issue of royalties (they do not pay their creators royalties on foreign sales, for example), many worried that creators would get digitally stiffed. On Monday Marvel Editor-in-Chief Joe Queseda expressed that he was shocked, shocked that anyone would be interested in such inside baseball, and that of COURSE a digital royalty program had always been planned. Depends on what kind of fan you are. If you're a collector -- someone who slabs and/or bag-and-boards their comics, stores them in longboxes according to a rigorous cataloging system and generally fetishizes the physical experience of comic-reading -- you're likely to dismiss this the way the people who say things like "I love the way a real book smells" dismiss the Kindle. If, like me, you're simply an accumulator -- someone who's only too happy to wait for a given story to be collected in trade paperback because it means there'll be fewer stacks of comics shoved under the bed -- the Digital Age is your age. Case in point: for the past two weeks, D.C. has been steamier than Heat Miser's underwear, and I haven't been willing to make the trek across town to my local shop. I found myself gazing longingly at my iPad, willing it to travel a few years into the future and back, loaded with the weeks' new titles. Don't get me wrong: Good comic shops are friendly, supportive places where impromptu discussions break out, retailers get to know their customers' tastes and hand-sell them new titles, and the atmosphere is welcoming, human, and fun. ...But comics download in, like, four SECONDS. And the air outside is, no kidding, broth. So, yeah: The writing's on the wall, as far as I'm concerned, and it reads: "Stay home. Grab a beer from the fridge. Pick up the tablet-thing, and press 'Buy.'" UPDATE: Earlier today, DC announced it was shuttering Zuda comics, its first, halting stutter-step into the realm of digital comics, and folding most of its content into the DC app. File this between Experiment, Failed and Experiment, Noble: Zuda had some great content but a lousy interface, and by marrying its mission (to feature new creators) to an American Idol mechanic (fans voted their favorites), it never managed to shake off the hormonal musk of a high school popularity contest (Web 2.0 edition).